Recycling is not always about the knowledge of retransforming one metrical back to its original form. Sometimes recycling is all about passion and creativity. Take for example the wonderful Italian design studio Manoteca. The studio is a Bologna-based design lab that specializes in restoration, reinvention, and re-design of abandoned furniture and objects. “We really like the idea that in every object holds somebody's life”, writes the studio in their website.” We hope that whoever is going to possess an object will think about that and take good care of it. Manoteca is a lab where old and abandoned things are hosted among with recycled materials, reinvented and reassembled. They all are one-offs, handmade and treated with natural paints”. 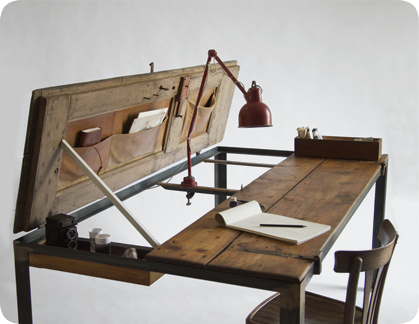 One of their simple and best works is called Indoor, an elegant old wooden door that was transformed into a unique working table. Rough, beautiful, and full of history, the clever piece works as a desk if opened and functions as an eight-seat dining table if closed! Measuring 198 cm long by 102 cm wide and 80 cm high, Indoor is the perfect size to work in a multifunctional manner, as a desk or as a table. When it is opened, handy fabric pockets placed on the door’s panels can be filled, and a wooden drawer on the side was designed for keeping everyday materials at hand. Still keeping the beautiful traditional details that make it unique — old marks, hinges and locks — Indoor is a great example of restoration done with readymade. Next time you stumble on old doors, you’ll know what to do with them.